Public storage needs tend to arise out of situations often called “the 4Ds of life:” death, divorce, downsizing and dislocation (source). Hey, life happens, and we don’t judge! Brighton Henrietta Storage offers you several affordable storage unit sizes to fit your self-storage needs. Our 5×10 Storage Unit, approximately 50 square feet, is a perfect and affordable size public storage space for most common household items and personal belongings in cardboard boxes, file cabinets, smaller furniture, small bedding and more. It’s also a very versatile storage area for yard tools or business items such as file boxes, office furniture, fixtures, lawn equipment, gardening tools, etc. 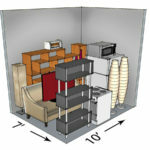 The 5×10 storage unit sizes sell fast! Be sure to reserve yours asap. Our 7×10 Storage Unit, approximately 70 square feet, is an excellent upgrade from the 5×10 unit. A few extra square feet in storage unit sizes make a big difference when it comes to storing a more significant quantity of household items or personal belongings. It’s perfect for large cabinets, most furniture, all bedding sizes and more. Great storage for smaller vehicles like motorcycles or ATVs. Larger lawn equipment and landscaping tools will fit well too. 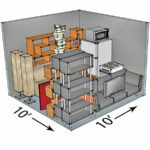 Our 8×8 Storage Unit, approximately 64 square feet, is a comparable, wider upgrade from the 7×10 unit. The 8×8 extra space allows for all kinds of storage options. Pack away a lot of your household items and personal belongings, wide furniture, moving boxes, etc. It’s also a perfect storage option for medium-sized vehicles and trailers, motorcycles, ATVs, snowmobiles, etc. 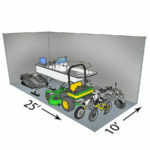 Landscapers will enjoy easy-access lawn equipment and landscaping tool storage. Our 8×10 Storage Unit, approximately 80 square feet, is a beautiful upgrade from the 7×10 unit. 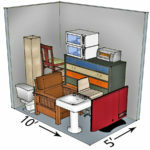 Compared to the 5×10 storage unit, the 8×10 extra space allows for all kinds of storage options. Pack away a lot of your household items and personal belongings, large furniture, moving boxes, etc. It’s also a perfect storage option for medium-sized vehicles and trailers, motorcycles, ATVs, snowmobiles, etc. Landscapers will enjoy easy-access lawn equipment and landscaping tool storage. 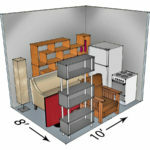 Our 9×10 Storage Unit, approximately 90 square feet, is an option sized self-storage unit size. The 9×10 space opens up several storage possibilities. If you’re moving from a smaller home or apartment, and need temporary or long-term storage, this is storage unit size may be a perfect fit. Store a lot of your household items and personal belongings, furniture, moving boxes, garage contents, and even small vehicles like motorcycles, an ATV, or a snowmobile. For landscapers, this is an excellent upgrade allowing for more in-and-out access. Our 10×10 Storage Unit, approximately 100 square feet, is a standard self-storage unit size and consists of the largest amount of self-storage units on our property. The 10×10 space opens up several storage possibilities. If you’re moving from a smaller home or apartment, and need temporary or long-term storage, this is storage unit size may be a perfect fit. Store a lot of your household items and personal belongings, furniture, moving boxes, garage contents, and even small vehicles like motorcycles, an ATV, or a snowmobile. For landscapers, this is an excellent upgrade allowing for more in-and-out access. 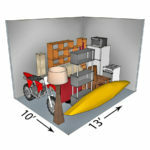 Our 8×13 Storage Unit, approximately 104 square feet, is a very good self-storage unit size upgrade. 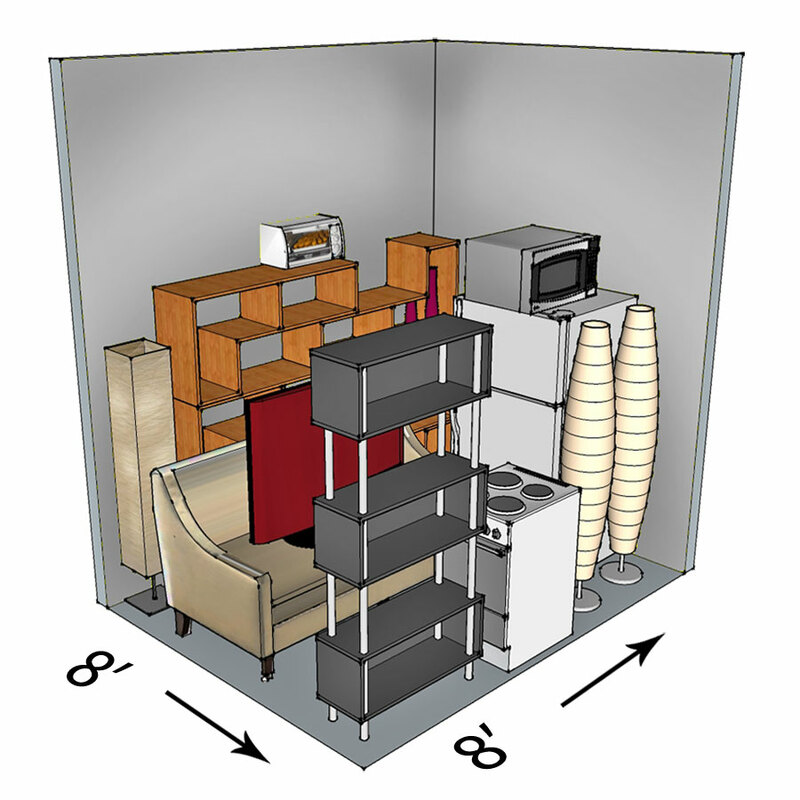 The 8×13 space opens up more storage space opportunities for longer items, especially if you’re in transition from moving into a new home or apartment, and you will need temporary or long-term storage. Store away just about all of your household items, personal belongings, furniture, moving boxes, garage and shed contents, and even small vehicles like motorcycles, an ATV, or a snowmobile. For landscapers and contractors, this is an excellent upgrade allowing for multiple pieces of equipment and tools to be safely stored for the season. Our 10×13 Storage Unit, approximately 130 square feet, is a very good self-storage unit size upgrade. 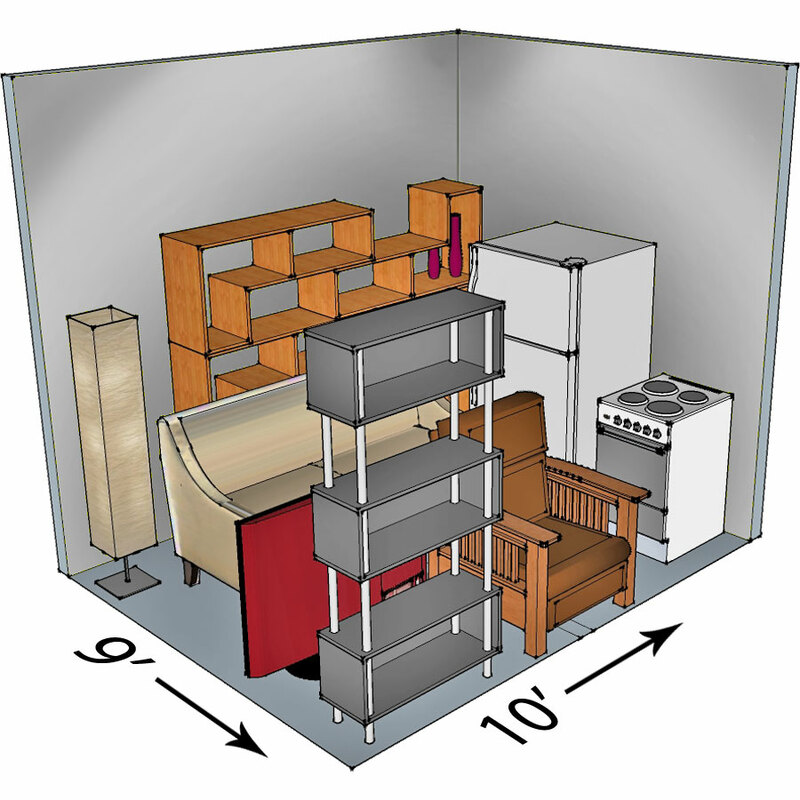 The 10×13 space opens up more storage space opportunities, especially if you’re in transition from moving into a new home or apartment, and you will need temporary or long-term storage. Store away just about all of your household items, personal belongings, furniture, moving boxes, garage and shed contents, and even small vehicles like motorcycles, an ATV, or a snowmobile. For landscapers and contractors, this is an excellent upgrade allowing for multiple pieces of equipment and tools to be safely stored for the season. 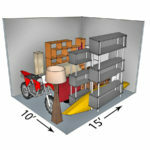 Our 10×15 Storage Unit, approximately 150 square feet, opens up deeper storage space opportunities. Whether you’re moving into a new home or apartment, and you will need temporary or long-term storage, you will be able to store your belongings easily. Large furniture, moving boxes, garage and shed contents, and even medium-sized vehicles like motorcycles, compact cars, ATVs or snowmobiles on a trailer and more. For landscapers and contractors, this is an excellent upgrade allowing for larger pieces of equipment and tools to be safely stored for the season. Our 10×17 Storage Unit, approximately 170 square feet, opens up deeper storage space opportunities. Whether you’re moving into a new home or apartment, and you will need temporary or long-term storage, you will be able to store your belongings easily. Large furniture, moving boxes, garage and shed contents, and even medium-sized vehicles like motorcycles, compact cars, ATVs or snowmobiles on a trailer and more. For landscapers and contractors, this is an excellent upgrade allowing for larger pieces of equipment and tools to be safely stored for the season. Our 10×20 Storage Unit, approximately 200 square feet is a limited availability storage room option. Be sure to grab this one up fast! 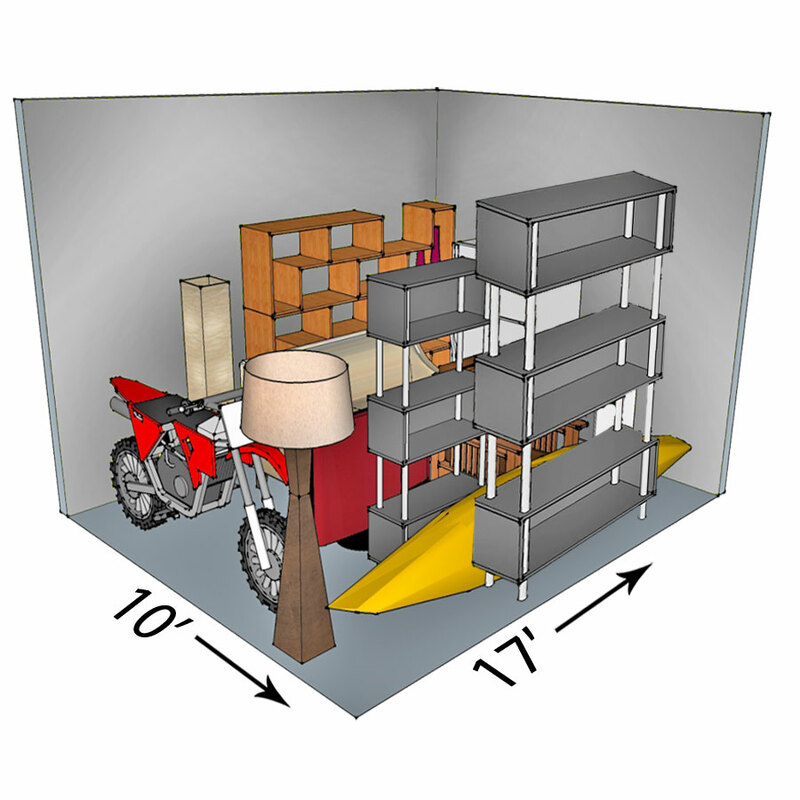 200 Square feet of deep, wide storage space will give you all kinds of storage possibilities such as temporary or long-term storage of furniture, boxes, a car or small truck, vehicles like motorcycles, compact cars, ATVs or snowmobiles on a trailer and more. Landscapers and contractors love this storage unit for affordable storage and convenience. Store your equipment and tools with easy access, 24/7. 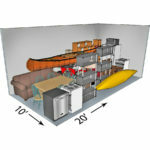 Our 10×25 Storage Unit, approximately 250 square feet, is our largest, deepest and widest storage unit. It’s perfect for almost any storage need. If you’re moving, place the contents of your home or office for temporary or long-term storage. Extra-large furniture, moving boxes, garage and shed contents, an automobile or truck – great classic car storage, motorcycles, ATVs and snowmobiles, trailers and more.